Perforated sheet materials are used as screens in separators, walkways, sunscreens, ventilation, and decorative coverings. They are constructed by machining or punching holes in a piece of sheet metal or plastic. Perforated sheets are often stronger or more rigid than other mesh products because of their solid sheet structure. Wire mesh is an alternative to metal perforated sheet, but tends to be lightweight, flexible, and not as durable as other perforated and expanded sheet material. Selecting perforated sheet materials requires the buyer to identify the required physical specifications of the sheet and the material(s) of construction. This selection guide is designed to help buyers with this process. Opening size, overall width, and hole pattern are the most important characteristics of perforated sheets. Opening size is the diameter of each punched hole in a perforated sheet. For rectangular openings, select the opening width (smallest side of the rectangular opening) as a minimum value;select the opening length (longest side of the rectangular opening) as a maximum value. Overall width is the width of the entire length of sheet. Specifying the correct width is important for sheet installation or fitting a sheet as part of a larger system. Sheet length is usually determined by the amount of material a buyer needs or is predetermined by the distributor to set lengths that they wish to sell. Hole pattern is the pattern for how holes or punched shapes are ordered in a sheet. In straight patterns, the holes are in alignment horizontally and vertically. In staggered design, holes are also staggered evenly between rows. Holes come punched in many configurations, including round, square, or hexagonal shapes. It is important to select a perforated sheet also based on the materials used in its construction. Material selection determines a sheet's strength, chemical and corrosion resistance, and hardness. Materials used to construct sheets include metals and plastics. Metals and metal alloys tend to be strong and durable materials. Strength is an important quality for sheets because of their common use in heavy-duty industrial applications for separation or protection. The most common types of metals used to make perforated sheets are steel, stainless steel, and aluminum. Steel is used for its strength, stainless steel is used for its corrosion resistance, and aluminum is used for its lower density. For more detailed information on specific types of metals, explore the Metals and Alloys section of Engineering360's Product & Suppliers database. Plastics and polymers include a wide range of synthetic and semi-synthetic solids. Two classifications of plastics are thermoplastics and thermosetting polymers. Thermoplastics do not undergo chemical change when heated and can be molded again. Thermosets stay solid after taking shape initially. Plastics are not as common as metals for sheet construction because of their typically lower strength. Compared to metals, however, they can offer low cost, corrosion resistance, low friction, and flexibility. For more detailed information on specific types of plastics, explore the Plastics, Elastomers, and Polymers section of Engineering360's Product & Suppliers database. Perforated sheet materials are used in many applications, from heavy industrial to decorative. Metal perforated sheets are used as filters, grills, and guards in industrial applications, or as screens and panels in architectural applications. 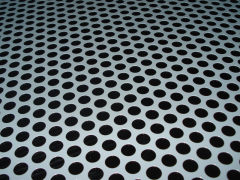 Certain types of perforated sheets are especially suitable for certain applications. Aluminum perforated sheet materials are very versatile because of their lightweight construction and are used as diffusers in light fixtures and even in cookware. Perforated polypropylene is corrosion-resistant as well as antimagnetic and antistatic, making it useful in clean rooms or laboratories.